Educate and entertain with these fun gift ideas from Toothfairy Island. You'll also be helping children in need. A percentage of all sales goes to America's Toothfairy. Mr. Tooth breaks himself up into a colorful, four layered high quality wood puzzle so he can teach children about his various parts and their function. The child will learn that the three hardest surfaces in the body are part of or next to Mr. Tooth. 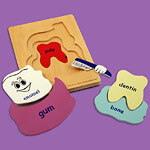 As the child explores each layer of this puzzle they will learn about enamel, gums, bone, dentin, pulp and nerves. Great for a lobby, classroom, or home play. 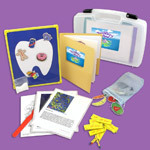 This package includes the Mr. Tooth 4 layer wood puzzle, a scripted lesson, worksheet and 10 packages of crayons. This colorful, four-tiered, wood puzzle uncovers the parts of the mouth layer by layer. 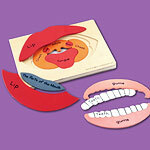 It introduces children to the various parts of the mouth and their function. Oh, but wait, why is there a hole in the bottom of the puzzle? Children will soon discover that the mouth is the gateway to the body and learn to be careful of what they put into their mouths. This lesson is great for a lobby, chair side, classroom or home play. Package comes with 4 layer wood puzzle, scripted lesson, 50 worksheets padded, and 10 packages of crayons. Sing, dance and have a great time while instructing children in the correct way to brush their teeth and wash their hands. Each lesson comes with its own song, words, and music. 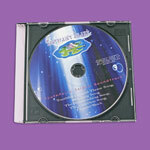 The CD includes the Tooth Brushing and Hand Washing Songs, Flosster Rock, the Nutrition Song as well as the theme song for Toothfairy Island. With choruses like, “Back and forth, up and down, do some circles round and round!” children will sing themselves into “good brushing habits.” Toothbrushing and Handwashing package comes with 2 Scripted lessons, laminated word sheets, printed score for both the Toothbrushing and Handwashing song, 2 different Toothbrushing and Handwashing charts in 50 sheet padded formats, 10 packages of crayons and 2 CD’s. Music currently only available in English. Lessons available in English and Spanish. Sing along with the Toothfairy Island gang and learn how to take better care of yourself at the same time! We have the Hand Washing Song, the Tooth Brushing Song, the Flosster Rock, the Nutrition Song and of course, The Toothfairy Island Theme Song. Be the first of your friends to know all of the words to these terrific songs and impress them with your knowledge at the same time! Children easily remember chorus such as “Back and forth, Up and down, do some circles round and round,” for brushing teeth or “One, two, three, four, five; six, seven, eight, nine, ten…make some suds and do it again” for hand washing. These are words you can sing and dance to! All on one magical CD, ready for every child or adult who wants to be a child again. 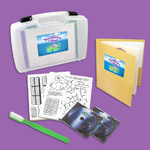 Toothbrushing and Handwashing package comes with 2 Scripted lessons, laminated word sheets, printed score for both the Toothbrushing and Handwashing song, 2 different Toothbrushing and Handwashing charts in 50 sheet padded formats, 10 packages of crayons, 2 CD’s all stored in a convenient carrying case. Have you ever wondered what happens to your tooth when the Toothfairy takes it while you are sleeping? Where does she take it? What does she do with all of the teeth that she collects? There are so many questions I am sure you want to ask the Toothfairy! In “Roberto Meets the Toothfairy,” that is exactly what Roberto gets to do. Roberto accidentally traps the toothfairy when she is removing his tooth. He then finds himself in the very unique situation of actually being able to talk to her. She is delighted to meet him. He starts peppering her with questions and after a few seconds she decides to take him to Toothfairy Island to meet some of the residents who can help answer his questions. On the island he meets Suds, a bubble dragon, and the island greeter who teaches him the importance of hand washing. Next Professor Seemore Science arrives and takes him on a field trip inside his own mouth where he learns about cavity causing bacteria and why it is important to eat nutritious foods. After that he meets Dr Hy Giene and with a little bit magic learns the importance of brushing his teeth. When he wakes up the next morning he learns that the people he met in what he thought was a dream are people he knows in his community. Discover who they are along with Roberto!